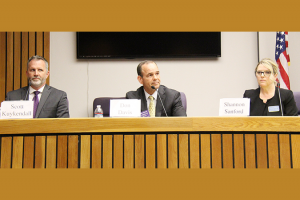 Stanislaus County Superintendent of Schools candidates Scott Kuykendall, Don Davis and Shannon Sanford answer questions during a forum hosted by the League of Women Voters held recently in Modesto. Student success is at the forefront of each candidate’s campaign in the race to become Stanislaus County’s new Superintendent of Schools, and the three education veterans vying for the title shared their visions for making that success a reality at a candidate forum held in Modesto. Gratton School District Superintendent Shannon Sanford, Waterford Unified School District Superintendent Don Davis and Stanislaus County Office of Education Assistant Superintendent Scott Kuykendall have all tossed their hats into the ring to replace County Superintendent Tom Changnon, who announced in January that he would not be seeking reelection. All three candidates argued why they believe they are best fit for the job on Tuesday, and while all are experienced, the types of schools and students they have overseen throughout their careers make them quite different. Kuykendall was hired by Changnon seven years ago and has since overseen schools including the Stanislaus Military Academy, Valley Charter High School and Come Back Kids, or adults who are looking for a second chance to earn their high school diploma. Overseeing such programs for underserved or atypical students has given Kuykendall the experience needed to take the ideas into other schools as well, he said. Sanford is currently the longest-serving school district superintendent in the county and serves as the one-woman show for GSD, overseeing departments like human resources and others at one of Stanislaus County’s smallest districts. Her top objective if elected, she said, would be to create a strong base for TK-8 students. “How do you do that? By integrating STEM, or Science, Technology, Engineering and Math, and increasing vocational opportunities for students,” Sanford said. Davis has served as WUSD Superintendent since 2009 and during that time took Waterford High School’s test scores from worst in the nation to among the best. This year, the high school was awarded the prestigious California Gold Ribbon Award by the California Department of Education for Davis’ efforts, which included a focus on STEM, promoting literacy and developing model instructional programs. Sanford made it clear during Tuesday’s forum that if elected, she would work to help school districts within the county collaborate more, whether it be meeting with superintendents to see how they would like to use technology or sitting down with administration at low-performing schools to figure out what can be done to improve scores. Collaboration could also come into play when dealing with racial issues on campus, she added, or when deciding what no programs to implement throughout the county. “I would like to explore the different things that are going on at each high school more in depth…the 24 districts plus the county, we seem to be doing our own thing and I think we all need to get on the same page,” Sanford said, suggesting that much like different schools throughout the county have their own vocational specialties, each district as a whole could have an overarching specialty depending on what location of the county they are in. When asked what he would do to improve situations at “poor-performing schools,” Kuykendall pointed out demographics and how he is poised to navigate Stanislaus County’s diverse pack of students. Davis responded to Kuykendall’s statement with his own argument. When Waterford High School was a poor-performing school he didn’t blame it on the school’s zip code or demographics, he said, but turned things around in the classroom. “At Waterford we had a process of instruction that could be looked at and taken back and replicated. The answer to improving the outcomes for our kids is in the classroom…and you’ll have a superintendent of education that has lived it,” Davis said. There were issues that all three candidates agreed on, like the need for more technology and Career Technical Education in the county’s schools and the importance of funding for Special Education. At Gratton, the Special Education program was cut because of a lack of funding, Sanford said. All three appreciate Common Core and the uniformity it has brought to schools nationwide but wish it could have been rolled out in a more effective way, rather than all at once. And, in light of recent mass shootings, the trio answered whether or not they believe Stanislaus County is a safe place for students. The answer for each candidate was yes, citing safety measures like cameras and fences that the county has taken, as well as mental health awareness and clinicians on campuses to talk with students. “In this area, SCOE has done a wonderful job helping Gratton School District with different things we can do to improve safety,” Sanford said.